March 21st, 2014 on world down syndrome day we are celebrating our sons, daughters, nieces, nephews, aunts, uncles, friends and family members …… all that were born with Down syndrome. We are celebrating who they are, each and everyone one. Each are individual and offer so much for the world to see. They go to school, hang out with friends, take dance lessons, music lessons, some are involved with sports, have boy friends or girl friends, get jobs and so so much more. My son Andrew was born in 1991 with Down syndrome. Andrew has many medical and intellectual challenges associated with Down syndrome but he does not give up because of these challenges. Andrew graduated from Cardinal Carter High school in 2012 and has completed the Life Skills Program at St. Clair College (his graduation will be June 2014). Without a doubt i can honestly say, Andrew truly enjoyed all of his years of high school and many people gravitated to him because he was so outgoing and has an infectious smile. Like others, Andrew has many goals and achieving these goals are important not only to him but to our family as well. It’s amazing how Andrew overlooks his challenges and keeps moving forward until he has accomplished what he sets out to do. It is so important that we will work together as a family to help him achieve his goals so that he feels good about what he is doing. Now we know that not everyone can be a “rocket scientist” but everyone has dreams and goals to achieve and if we work with Andrew’s ABILITIES, achievement and satisfaction can be attained. I know this and I see it every time he sets out to do something, he has this passion that just shines right through him. You can see it in his smile and his eyes, right down to his soul. You cannot help but LOVE him and LOVE who he is. What he offers is so pure, unconditional and from his heart. Andrew kept telling us that he wanted to save money for college, so we worked together and figured out a way for him to earn some of his own money. Discussing ideas from selling Lemonade to working at local Golf Club our family helped him to start a business called “Group Hug Apparel” that consists of clothing with really cool and funky designs on them created by the one and only “Andrew”. This made Andrew feel so good about himself. 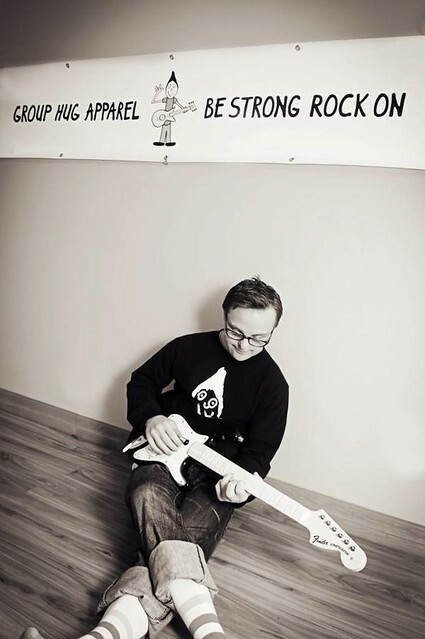 Andrew has a real love for music and his first design was a stick figured character holding drum sticks with the saying “Rock On” underneath of him and then it changed to “Be Strong Rock On” after he watched a show about Sick Kids. Like i mentioned earlier, Andrew has been in hospital many times and he has seen other children sick and in need of medical care and Andrew instantly said he wanted to help the sick kids from his shirt sales. This young man of mine, that I was given to take care of and help guide him through life and all of it’s obstacles, taught me a great lesson that day. He taught me that no matter what we are handed in our life we always have room to help others! Andrew put all of his challenges aside and wanted to help others. This is how he lives his life every day! From the very first t-shirt printed everyone loved what Andrew was doing. He was achieving his goals and helping others. Andrew has donated over $20,000 from his t-shirt sales and continues to make a difference not only in his life but others as well. Now, we are human and there are times when our family needs to find that deep inner strength because of medical issues that have kept Andrew hospitalized. We would, and still do, come together for a family GROUP HUG. A “Group Hug” that would give us the strength to deal with whatever was put in front of us. A “Group Hug” that wiped away tears. A “Group Hug” that keeps us focused and strong for Andrew and for ourselves. With all of this family mushiness and love happening of course we needed to call Andrew’s business “Group Hug Apparel” This Love remains front and centre everyday and it needs to stay front and centre for years to come. This is why our family celebrates World Down Syndrome Day and will also “Rock Your Socks” as well.